Icon Audio introduces new preamp and monobloc power amp | What Hi-Fi? "The MB150 combines the beautiful musicality of valve amplification with massive power delivery to produce an amplifier that is capable of driving even the most inefficient and quirky of speakers," says Shaw. In common with all Icon amps, the MB150 is hand built and features a point-to-point silver-wired circuit. The Class A triode front end is inspired by the Leak TL designs of old and uses the classic 1940s 6SN7 driver and phase splitter valves. The output uses four KT90 tetrodes, operating in parallel push-pull-configuration. A front panel mounted switch selects between two modes of operation: all-triode, which produces 100W, or ultra-linear, producing 150W. Also new from Icon is the LA4 MkII preamp. 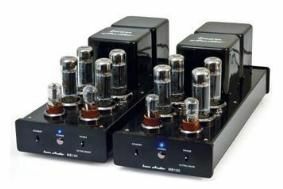 It keeps the same circuit, 6SN7 double triodes and double-choke power supply of the old model, but has a new exterior design, adjustable gain and uses a 274B valve instead of the previous model's pair of EZ80s. The Icon Audio LA4 MkII is available now for £699.95.